AJ and Brenda Dancer take their 2018 GMC 3500, 2017 Capri Camper, enclosed trailer, and IMCA stock car to race tracks. Ladies and gentlemen, get ready to camp at the race track. AJ and Brenda Dancer race IMCA stock cars. This means hauling a large enclosed trailer to race tracks, and sometimes camping overnight. To achieve this objective, the Dancers have tried a number of trailers and motorhomes. They even had a Class A. In the end, none of these RV types gave them the versatility or ease of ownership they wanted. Then they discovered Capri Campers. Simple, lightweight, and 100-percent custom built, a Capri Camper presented the opportunity to have exactly what they needed, and safely tow their car trailer. No more compromises – and they even liked the retro style! The Dancers had found the right tool for the job. Which, as you’re about to read, is actually a very expensive hobby. Before interviewing AJ and Brenda, we knew very little about the IMCA stock car racing scene. Now we’re excited to camp at a track and watch them race. Now only if we could talk IMCA into racing truck camper rigs. That would be a real show! How did you get into stock car racing? AJ: My dad raced when I was younger. When I was 15 I started working on my own car. I have been racing ever since. My current car is an IMCA stock car. IMCA stock car racers typically run 1978 to 1988 General Motors cars. GM cars from that era are really common and popular in racing. My stock car used to be a street car. I built it into a race car including modifications to the engine, front and rear suspension, brakes, and chassis. I am currently building another stock car for next year. 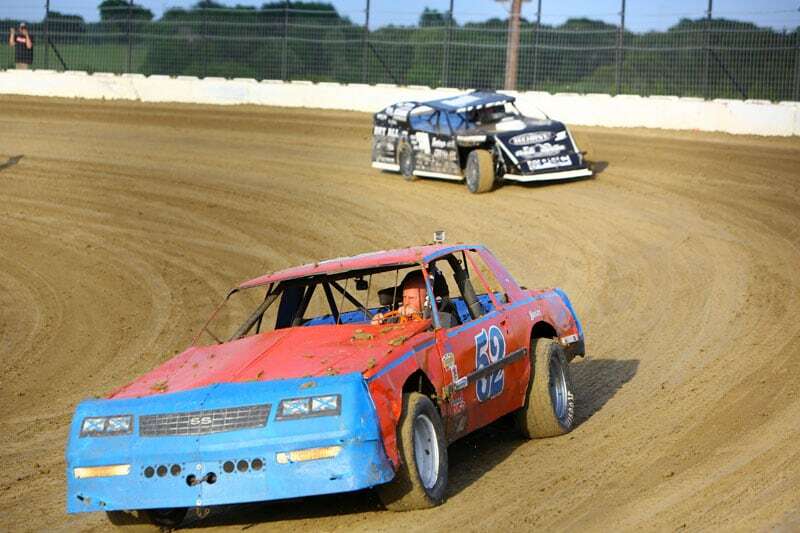 IMCA stock cars allow Novas, but no one runs them. So I’m going to do it. I also have an Enduro car, which is for endurance races. There are no rules with those races with about 300 laps, which is long. A normal car race is 15 to 20 laps. You mentioned IMCA. Could you explain what the IMCA is and how you got into it? How long have you participated in these events? Brenda: IMCA stands for International Motorsports Contest Association. As an organization, the IMCA has been around for over 100 years. Basically, if a dirt track is IMCA sanctioned, whatever IMCA classes of cars they run have to run by the same set of IMCA rules. For the last five years we have been a part of the IMCA. 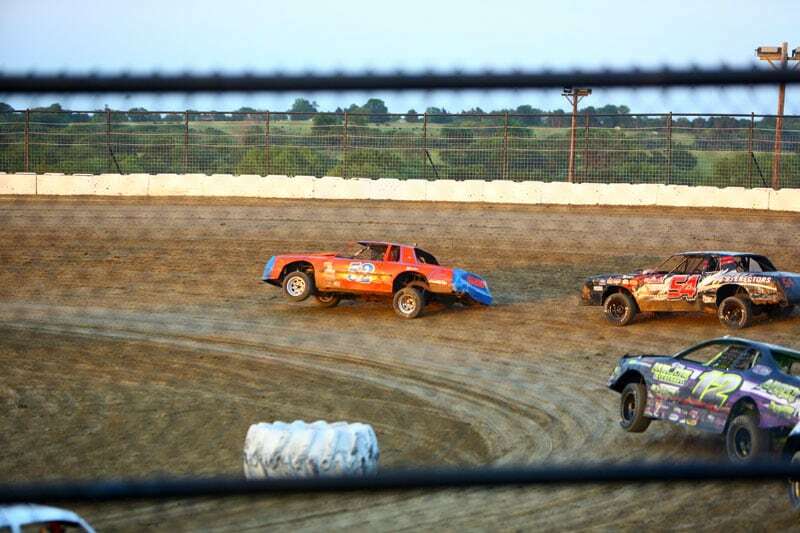 This past July we participated in the IMCA Dakota Modified Classic Tour. At the end of May we did the IMCA Red River Modified Tour. Is this a hobby, or something you do professionally? AJ: We both have regular jobs. There is no way I could make enough money racing.